Hassadi language is spoken in the mountainous region of Hambal village in District Doda of J&K state. The Population of the Village Stands between 1800-2000. However, Hassadi language comprises a small part of Linguistic repertoire of the village as the number of its speakers ranges around 200-300. This language is primarily spoken by the members of Masha community. The defining characteristics of this community are patriarchy and caste system. Since caste system is much prevalent in the village and Masha community finds its place in the lower strata while as Rajputs, Manhas and Rana form the upper class. They live in segregated colonies and each colony represents a specific social class. As the language is spoken by less than 300 people, Hassadi, a member of Indo-Aryan language is enlisted as one of the endangered languages in India. Some of the Languages which exist in the same region and in its adjoining areas are: Badarwahi, Pahari Dogri, Khashalli, Hindi and Kashmir. Hassadi is a language which has no written literature or a script of its own. It does not form a part of official communication like in public offices and educational institutions etc. Most of the people of Masha community are bilingual and use their native language only in their homes and in their immediate social context. While as Hindi is used as an alternate language to communicate with the people of other communities. So far, no linguistic research or documentation has been carried on the language. Hinduism is the most widespread belief practiced by the speakers of Hassadi. They too worship different deities like other believers of their faith. These people usually pray to their gods in temples however, a small part of their houses is dedicated to a special deity. Various festivals are celebrated by the community members but Mata Dedni festival is the only festival which is specifically celebrated twice a year on 13 April and 25 August, with great fervor and enthusiasm. On this festival various sacrifices are offered to please the deity.The Inhabitants of the Hambal village speaking Hassadi belong to working class. Their life style is very simple. They have hand to mouth living. Most of the people live in kaccha Houses made of mud, wood and straw. 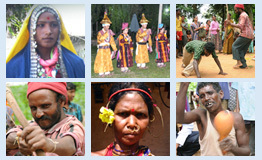 Cultivation, shop keeping, wood cutting, shoe mending, cattle rearing are the main occupation of these people. In Hassadi community, bullock-carts, horse are the main mode of transport. While as, people usually walk on foot to visit other nearby villages. They also use bullock-carts and horses to carry essential goods like grains, crops, hay and other such commodities. Major portion of the language such as Grammar and Ethno-linguistic sketch of the language and community has been covered. Currently, the development of an electronic dictionary of Hassadi language is in Progress.